This article will examine Mrs. White's writings about Enoch and uncover the mysterious sources she used. This article will also reveal that Mrs. White's account of Enoch differs sharply from the Biblical account in certain details. Enoch is an all-important figure in the writings of Ellen White. Despite the fact the Bible only mentions him in a handful of verses, Ellen White mentions him hundreds of times in her writings. According to her writings, Enoch, attained to a perfection of character that allowed God to take him to heaven. Therefore, Enoch is an apt representation of what all Seventh-day Adventists need to strive to become before their translation into heaven at the second coming of Christ. Here we are informed that Enoch looked upon a celestial city named Zion. It seems like more than a coincidence that both Sister White and Brother Smith talk about Enoch's celestial city of Zion. But the coincidences do not stop there. Is the fact that both Joseph Smith and Ellen White taught that Enoch was a Christian merely another mysterious coincidence? "In prophetic vision he was instructed concerning the death of Christ, and was shown His coming in glory, attended by all the holy angels, to ransom His people from the grave. He also saw the corrupt state of the world when Christ should appear the second time--that there would be a boastful, presumptuous, self-willed generation, denying the only God and the Lord Jesus Christ, trampling upon the law, and despising the atonement. He saw the righteous crowned with glory and honor, and the wicked banished from the presence of the Lord, and destroyed by fire." 3. Was shown the flood: Verses 34,38--And the fire of mine indignation is kindled against them; and in my hot displeasure will I send in the floods upon them, for my fierce anger is kindled against them. ... But behold, these which thine eyes are upon shall perish in the floods; and behold, I will shut them up; a prison have I prepared for them. 6. Saw righteous crowned: Verse 56--"...the saints arose, and were crowned at the right hand of the Son of Man, with crowns of glory..."
The parallels between the writings of Joseph Smith and Ellen White on Enoch are simply too amazing to ignore. It appears that Mrs. White did not receive her teaching on Enoch from the Bible or from angels but from the Mormons. After remaining for a time among the people, laboring to benefit them by instruction and example, he [Enoch] would withdraw, to spend a season in solitude, hungering and thirsting for that divine knowledge which God alone can impart. 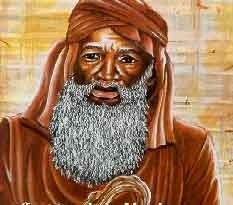 Communing thus with God, Enoch came more and more to reflect the divine image. His face was radiant with a holy light, even the light that shineth in the face of Jesus. As he came forth from these divine communings, even the ungodly beheld with awe the impress of heaven upon his countenance. (p. 86) 3:20. And he [Enoch] did in this manner for many years, and he afterward concealed himself for six days, and appeared to his people one day in seven; and after that once in a month, and then once in a year, until all the kings, princes and sons of men sought for him, and desired again to see the face of Enoch, and to hear his word; but they could not, as all the sons of men were greatly afraid of Enoch, and they feared to approach him on account of the Godlike awe that was seated upon his countenance; therefore no man could look at him, fearing he might be punished and die. Enoch was translated to heaven 69 years before Noah was even born! How could he have received instruction from Noah? The building of the ark did not commence until 1536, a full 549 years after Enoch had been translated. How could Enoch have preached while the ark was being built? Enoch was translated to heaven 669 years before the flood. Was this "just before" the flood? QUESTION: Did Ellen White really see Enoch in vision? Or was she simply fabricating history? There are a couple of issues with this statement. First, Mrs. White describes Jude as "a prophet of God." Nowhere in the Bible is Jude called a "prophet." He was Jesus' half-brother, the brother of James (cf. Mark 6:3, Matt. 13:55). He is not mentioned elsewhere in the Bible and if it were not for the brief letter of Jude, we would know virtually nothing about him. There is nothing prophetic in the book of Jude except for one verse about the second coming, and that statement is simply a quote from another book, so there is no basis upon which to call Jude a prophet. Mrs. White says that Jude "mentions the work of Enoch." This statement is in context with her eariler statement that Enoch prophesied the second coming of Christ. From this we can conclude that Mrs. White believed Enoch prophesied Christ's second coming based upon Jude 1:14. Unfortunately, that statement in Jude 1:14, however true it may be, did not come from Enoch, but from a spurious author who wrote an apocryphal book called the Book of Enoch. And Enoch also, the seventh from Adam, prophesied of these, saying, Behold, the Lord cometh with ten thousands of his saints, to execute judgment upon all, and to convince all that are ungodly among them of all their ungodly deeds which they have ungodly committed, and of all their hard speeches which ungodly sinners have spoken against Him. And behold! He cometh with ten thousands of His holy ones to execute judgment upon all, and to destroy all the ungodly: And to convict all flesh of all the works of their ungodliness which they have ungodly committed, and of all the hard things which ungodly sinners have spoken against Him. Nearly all scholars are agreed that the book was not written by Enoch. Because fragments were found among the Dead Sea scrolls, most scholars agree the book appears to have been written during the second century before Christ. There is no mention of the book being in existence prior to that time. It is evident that Mrs. White had no idea the book Jude quoted from was a spurious work written long after Enoch died. We are told by her supporters that Mrs. White, as a prophet of God, was able to "detect error", and yet Mrs. White writes as if Jude is quoting from the actual writings of Enoch instead of a spurious work written by an anonymous author long after Enoch died. Whether or not Mrs. White had divine insight into the life of Enoch is a matter of debate. Nevertheless, it is apparent that her writings on Enoch seem to form a striking parallel with Joseph Smith's writings on Enoch. Furthermore, her comments about Enoch preaching while the ark was being built cast further doubt on her credibility. Mrs. White's writings on Enoch are interesting and they often provide a good moral lesson. However, based upon the evidence presented above, a question remains: Are her writings of Enoch historical facts gleaned from her visions, or are they merely a fictional account based upon the writings of others? 1. Ellen White, Signs of the Times, Oct. 12, 1904. 2. Ellen White, Early Writings, p. 39. 3. Ellen White, Testimonies, vol. 8, p. 330. 4. Joseph Smith, Moses 7:19. 6. White, Early Writings, p. 39. 7. White, Testimonies, vol. 8, p. 330. 8. Ellen White, Testimonies, vol. 6, p. 392. 9. Ellen White, Signs of the Times, Jan. 13, 1898, para. 9. 13. Ellen White, Patriarchs and Prophets, p. 85. See also Testimonies, vol. 8, p. 330. Noah and his family were not alone in fearing and obeying God. But Noah was the most pious and holy of any upon the earth, and was the one whose life God preserved to carry out his will in building the ark and warning the world of its coming doom. Methuselah, the grandfather of Noah, lived until the very year of the flood; and there were others who believed the preaching of Noah, and aided him in building the ark, who died before the flood of waters came upon the earth. Noah preached one hundred and twenty years to the people before the Flood, and yet there were few who appreciated this precious, probationary time. Save Noah and his family, not one was numbered with the believers and entered into the ark. Of all the inhabitants of the earth, only eight souls received the message; but that message condemned the world. 16. Ellen White, Spiritual Gifts, vol. 3, p. 59. 17. Ellen White, Review and Herald, Apr. 29, 1875. 18. Ellen White, S.D.A. Bible Commentary Vol. 1, p. 1088.